The only two seasons of American Idol I watched from start to finish were the ones where Kelly Clarkson and Carrie Underwood won. Other than that I've only caught snippets here and there. For this season Megan Joy Corkrey is my favorite. 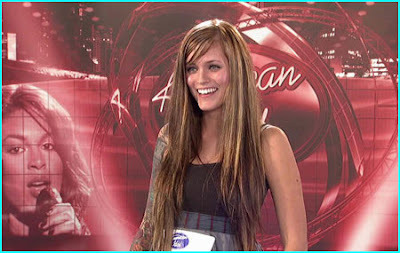 The Utah auditions were one of the few episodes I caught and her song was pretty memorable. I imagine her doing a She & Him type album. Something about the way she sang reminded me of Zooey Deschanel. Anyhow, I just found out that she made it to the final 13, or 12 or whatever stage of the show they're on now. It would be nice if she won because winning anything is big, especially a show like this. And even if she doesn't win I still hope she puts out an album. Merge Records would be a nice fit. Other than Corkrey I remember liking Rose Flack but apparently she got cut. Oh well. Best wishes to her! Do you watch American Idol? If so, who are some of your favs?